Personal Capital is one of my favorite online tools. I use it to aggregate all of my financial accounts so I can see them in one place, monitor my net worth, track my spending, and most importantly, track and monitor my investments. This last part is very important, as tracking your investments across several accounts can be difficult. But Personal Capital has a way of making this task extremely easy—and eye opening. In this review, I’ll show you how Personal Capital can solve a variety of problems, and why I use it. And I hope you will give it a try as well. After all, it is free, and you can learn so many valuable things about where your money is held, how you spend your money, and how your investments are working together. Let’s start with the problem… and then look at the solution. When my wife and I were married, we both brought our separate financial accounts into the marriage. For us, this meant one or two bank accounts each, two IRAs, two Thrift Savings Plan accounts, a couple credit cards, some Certificates of Deposit, my car loan, a mortgage, etc. All of these financial accounts are easily managed on their own. But the more accounts you add, the more difficult it becomes to understand where everything is and how they work together. Within a couple years of marriage I was working on my second post-military job, had started a small business (including this website and others), and my wife had separated from the military and started a job with the civil service. In those two years we added two 401k plans, a civil service Thrift Savings Plan account, two different pensions, a Home Equity Line of Credit to finish our basement, another credit card to earn travel rewards when we took our honeymoon, a business bank account, a business credit card, and several other other small banking and investment accounts. Our total number of financial accounts doubled in two years. Managing our money soon became a little more complicated! My initial solution was to create a spreadsheet to track everything. And that worked for awhile. But it took a lot of manual labor to enter all the numbers, track how we were spending our money, and monitor our investments. I have tried several different financial tools, including the online and desktop versions of Quicken, and Mint.com. All of those were good, but they had their limitations. Enter Personal Capital. Personal takes some of the best elements from all of the tools I have used, wraps them into a complete online package, and automates many things. So using it is less work than many of the other tools I have used. And tracking investments was extremely eye-opening and valuable. I’ll explain in just a moment why you should absolutely use a tool like Personal Capital if you have more than one investment account. Let’s take a more in-depth look at all of these features. One of the biggest problems I ran into was understanding where all of my money was. Not because I had too much money, but because I had too many accounts. Between my wife and I, we have multiple bank accounts, retirement accounts, credit cards, a mortgage, and some business accounts. Seeing everything in one place makes it easier to get a handle on managing our finances. At the minimum, I think everyone should review each of their financial accounts at least once per month to verify the accuracy of the transactions and to make sure everything is in order. I still try to log into every account each month. But Personal Capital will also do it for me. When you use a tool like Personal Capital, you can link multiple financial accounts to your dashboard. You do this by entering the login information for each financial account into the Personal Capital interface. Each time you log in to Personal Capital, they automatically log into each linked account and bring back the data, which you can then review in different ways. This is a read-only tool, which means you can’t change anything in your account, make transactions or withdrawals, or move money. *Note: Personal Capital uses bank-level security. I’ll cover this later in the review. It’s good to know your net worth, which is generally defined as assets (things you own) minus liabilities (things you owe). Personal Capital will automatically calculate your net worth each time you log in to your account. The software will log in to all your accounts and update your most recent information. Then it will add the assets and subtract your liabilities, leaving you with your net worth. The final number is a measurement of your financial health. Some people get wrapped up in their overall net worth number. I think it is good to know, but I don’t think it’s the most important metric for financial health (cash flow, human capital, and other metrics can be more important in some situations). In my opinion, knowing your net worth is a good relative metric, which can show you how your financial health is changing over time. Depending on how many accounts you have, calculating your net worth can be a time-consuming task. Then tracking and analyzing that information over time can add another layer of fun (or hassle)! Personal Capital tracks your net worth automatically. Tracking your spending can be an important tool for saving money. We often don’t realize how much we actually spend on certain items, and it’s not until we track our spending over time that we are able to see these trends and take the appropriate actions. Tracking our spending has opened my eyes to several areas where we were spending money that didn’t align with our long-term goals. But you have to be aware of your spending habits before you can change them. There are many programs you can use to track spending. Many banks allow you to categorize your income and spending. And this works well if you only have one bank. But it doesn’t always work as well if you have multiple accounts. There are other programs as well, including a written ledger or notebook, Excel spreadsheets or Google Docs, Mint.com, and Quicken. All of those tools can work well. And Mint and Quicken both sync to many bank accounts like Personal Capital. But Mint and Quicken aren’t as powerful when it comes to tracking and understanding your investments. So I opted to go for the all-in-one solution and track my spending with Personal Capital. Managing multiple financial accounts can be tricky. In general, you should view all your investments as one giant portfolio. There are certain factors you should also consider, such as which investments to put into retirement accounts, and which should be in taxable accounts. But they should all be viewed together when it comes to asset allocation. Balancing your investment portfolio can be easy if you only have one or two accounts. Say a Thrift Savings Plan account, and an IRA. But when my wife and I were married we each had both of those accounts, so we already had 4 investment accounts to look at when balancing our portfolio. Within 2 years of marriage, I had two more 401k plans and a pension to add to the mix, and my wife had a civil service TSP account. Managing 8 investment accounts is substantially more difficult than managing 4 accounts! The problem with managing multiple investment accounts is not always understanding how all your investments work together. Is your portfolio diversified? Do you have too much weight in any one type of fund? Personal Capital makes it easy to see how all your investments work as one investment portfolio. You will no longer have to guess what your total asset allocation is for each sector. Personal Capital does it for you automatically, as well as shows you how much you are spending in asset management fees. This makes it easy for you to quickly see where your portfolio is in balance, and where it needs attention. You can then use this information to make informed decisions, such as rebalancing your portfolio, selling assets in certain classes, buying others, etc. The best part about Personal Capital is the cost – it doesn’t cost anything to use the above services. You can track your financial accounts, monitor your spending, and view detailed information about your investments. All of this will enable you to better manage your finances and investments. 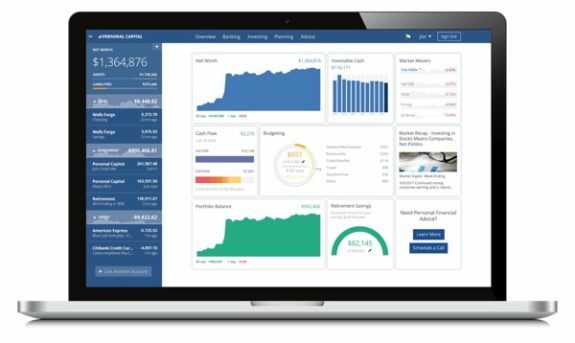 I have been using this tool for about two years now, and it has helped me become a better money manager and investor. They even have apps for iOS (iPhone and iPad), and Android devices, making it easy to manage your money on the go. So how does Personal Capital make money? Great question. The general online tool is free to use, and it is extremely powerful. In fact, it is one of the best free online tools for individual investors. But not everyone has the time, knowledge, or desire to manage their own investments. So Personal Capital also offers an investment management service that is not free. There is no hard sell, and you don’t have to use this service if you do not wish to do so. The first thing that happens is you are assigned a financial advisor who will get on a phone call with you and ask you about your goals, needs, investment timeline, risk tolerance, and other factors. Then they will take this information and give you a customized investment plan based on your inputs. Should you decide to allow Personal Capital to manage your investments, you would transfer your investments into their management. From there, they take control of the investments, and you will get regular updates on the performance. There is an ongoing management fee for this service, which is how they are able to make this tool free for everyone. These investment management fees are very reasonable when you consider that many individual investment advisors charge a flat rate fee of 1.0% of assets under management. Visit Personal Capital to learn more about their management services. As you might imagine, security is a major concern for many people. It certainly is for me. I subscribe to an identity theft service and I am borderline paranoid when it comes to giving personal or financial information over the Internet or Telephone. But I have reviewed their security and their processes and I have used their service for about two years now. I’m very comfortable with the level of security they provide. Personal Capital’s data is encrypted with AES-256 with multi-layer key management, including rotating user-specific keys and salts. They also employ data encryption, maintain higher security ratings than many banks and brokerages, monitor for fraud, and have strict user authentication before you can even access your account. It’s also important to note that the data is read only—no one can make changes to your accounts, transfer money, make withdrawals, or take other actions at your financial accounts through Personal Capital. All a user can do is view the account balances and the underlying data. Click this link to learn more or sign up for a FREE Personal Capital Account.